ON Semi publishes a catalog of its image sensor products combining Aptina, Truesense and Fillfactory sensors in a single document - an impressive list. 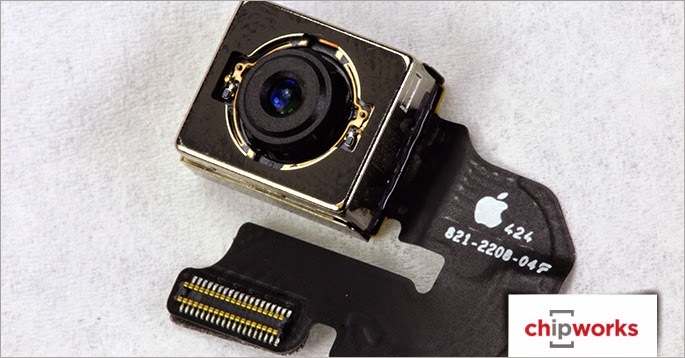 "The year 2015 will be an exciting one for modern cameras and camera technology again! 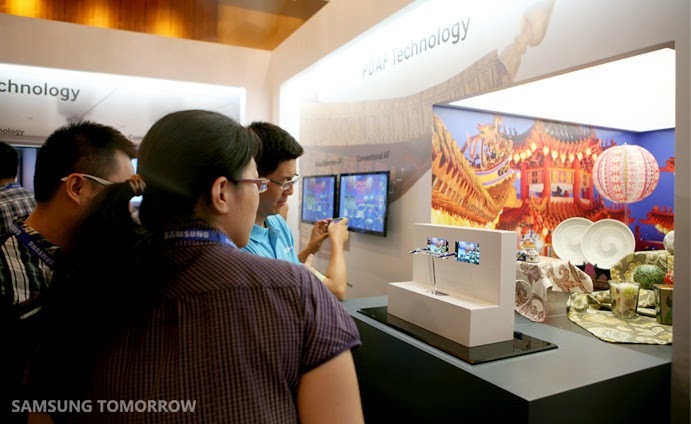 ...It will be the first time the whole range of standard resolutions, from VGA to five megapixels and above, is expected to be covered by CMOS technology. CMOS will therefore become relevant for all existing and new applications in machine vision, as well as in applications outside the factory floor such as medical or intelligent traffic systems." "For many years Flir Systems has made efforts to make thermal cameras more affordable and accessible. This is a trend that will continue in 2015. Because of this increased affordability, it will be possible to deploy multiple cameras for a variety of applications and more customers will be able to benefit from the economies of scale." "The demand for very high-resolution area image sensors for machine vision applications is expected to continue to grow. 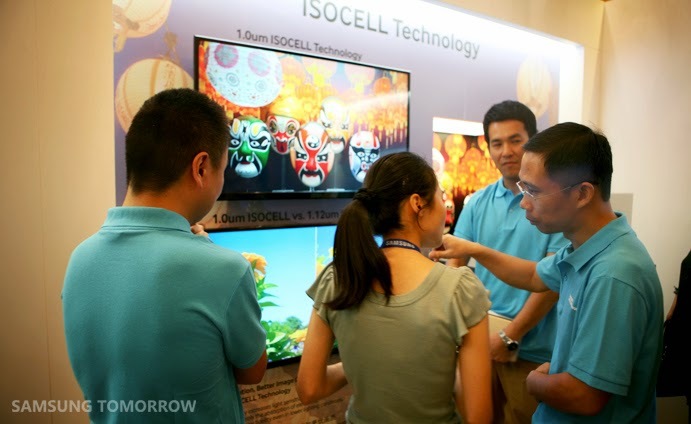 This growth is mainly fueled by the expanding need for inspection of LCD panels used in smart phones, tablets and TVs. These screens are not only becoming bigger, but also the resolution is continuously increasing. This combination is at the basis of the demand for 50+ megapixel resolution inspection cameras and image sensors. Frame rate requirements are in the 10 frames per second range – out of reach of most CCD-based camera solutions. Although most camera users and producers would prefer global shutter based CMOS solutions, a fair amount of these applications can also be realized with rolling shutter type pixel-based image sensors. ...The realisation of smaller, high-performance global shutter pixels will remain a challenge. It implies that image sensor manufacturers have to migrate to more advanced and more expensive CIS process technologies. I also expect a growing demand for image sensors optimized for wavelengths outside the visible spectrum, more in particular for the capture of UV and NIR images. UV imaging is mainly driven by the needs of the semiconductor industry whereas NIR imaging is by non-obtrusive machine vision applications. 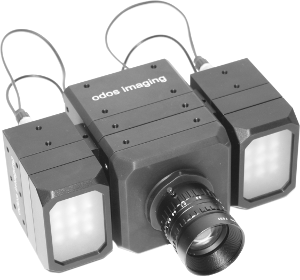 I expect that the demand for UV sensitive imagers will accelerate the development of backside-thinned and illuminated CMOS image sensors in industrial and professional applications. Although backside illuminated imagers are now the standard in mobile phone camera applications, they are still the exception in machine vision area. The larger pixels of machine vision imagers do not benefit much in terms of QE increase in the visible when using backside illumination. 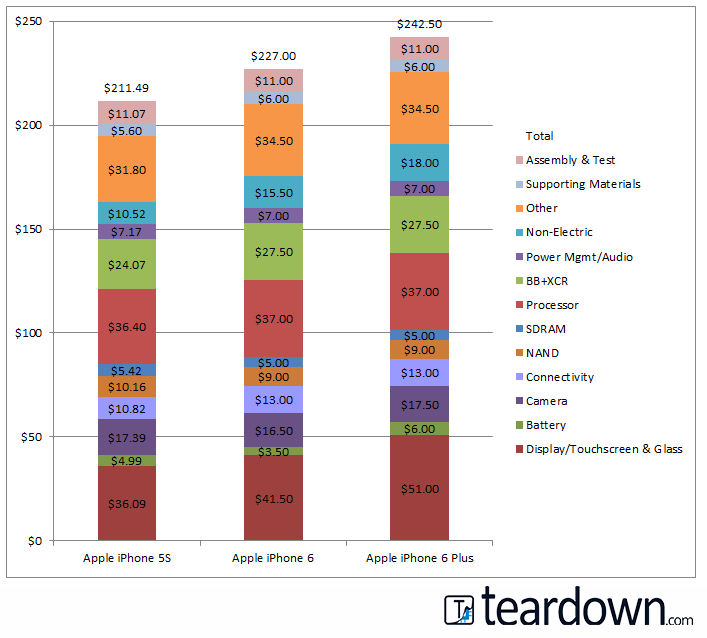 The limited performance increase cannot justify the significantly higher price. For UV however, the QE increase is significant and customers are willing to pay the higher price. The introduction of backside illuminated devices in industrial cameras is also delayed because few foundries are ready to support backside thinning and processing for such low-volume applications. For the same reasons, I do not expect to see so-called stacked backside illuminated CMOS image sensor technology to be applied shortly in dedicated machine vision image sensors." "In the past year imaging and automation customers have been adopting larger, higher resolution sensors. One-inch format sensors have become more readily available, and the machine vision industry is moving toward four and six-megapixel resolution versions of these larger sensors. The market will continue to push upward toward the nine- and 12-megapixel options – and even higher as technology evolves." "One of the most significant trends in imaging today is the continued evolution of CMOS image sensors as the technology of choice for general machine vision applications. A complementary trend is the reduction in the cost of processing image data within the camera – the price of FPGAs, microprocessors and memory continues to drop, while speed and capability continue to increase." "For LMI, we have identified two major segments of growth for 3D sensing technology. The first is the 3D scanning market where 3D scanners are used to build real world models of objects. The second segment is the 3D inspection market where 3D smart sensors are used to scan, measure, and pass or fail parts in an assembly process within a factory." "One emerging market segment on the cusp of a major change due to the introduction of machine vision is the transportation industry, an industry which has long suffered from an inability to collect quantifiably accurate infrastructure level information. With the introduction of MV technologies, the transportation industry could collect data multiple times per second, providing a quantity and quality of data not only cheaper than a magnetic loop, but considerably more robust than any other current sensor technology." 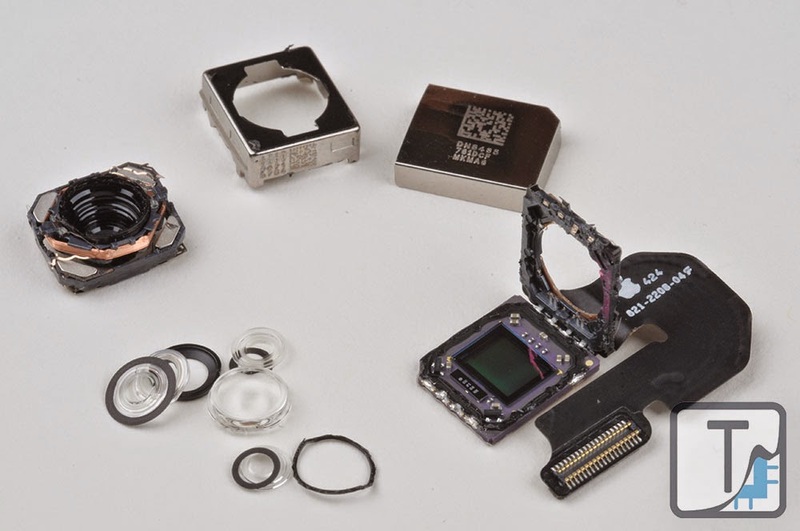 "New CCD and CMOS sensor technologies have also evolved in the last few years and have dramatically influenced the development of completely new types of imaging and machine vision systems. The number of global shutter CMOS sensors available in the market has increased and CCD technology, such as Sony’s new line of EXview HAD CCD II sensors, has also become more advanced, providing improved quantum efficiency, reduced smear, and increased sensitivity, including into the near infrared." "as applications are moving away from the factory floor and its controlled environment, the imaging sensors are exposed to extreme and possibly harsh environmental conditions, such as fog, rain and snow. Technically, we know how to get a decent image in these conditions by using high power lasers and gated image intensified CCD cameras, but these solutions are physically large, fragile and expensive, limiting their adoption to high-end, niche market applications. It is very likely that, based on the initial results, in 2015 we’ll demonstrate that a CMOS-based system can be used instead of a gated tube intensifier, removing the barrier to entry for many applications." The simulator was used to explore Monte-Carlo pixel variability, starting from classical 3T pixel to quite exotic structures, like carbon nanotube transistor-based pixel. 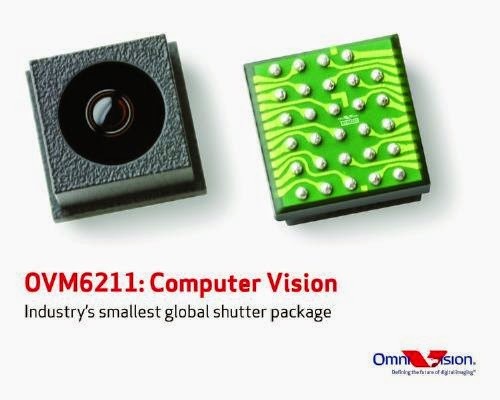 PR Newswire: OmniVision launches the OVM6211 CameraCubeChip, a complete global shutter camera in the industry's smallest form factor. The OVM6211 is aimed to a number of consumer applications, including machine and computer vision ones such as gesture recognition, eye tracking and motion detection. Built on 3um B&W OmniPixel3-GS pixel, the OVM6211 has 400 x 400 pixel resolution and speed of 120fps. The OVM6211 also features a unique ultra-low power mode, which allows it to be used in an "always aware" mode with minimum power consumption. The OVM6211 CameraCubeChip will be available in two packages. The OVM6211-RADA, intended for human interface systems such as eye tracking, will have a narrow field of view (FOV) at approximately 50 degrees. The OVM6211-RAHA, intended for applications including gesture recognition and wearable devices, will have a FOV wider than 90 degrees. The OVM6211 is currently sampling and is expected to enter volume production in Q4 2014. "The value that the OVM6211 brings to consumer electronics extends far beyond the machine and computer vision functionalities that it enables," said Aaron Chiang, director of CameraCubeChip marketing at OmniVision. "As a monolithic camera solution with x and y dimensions that are each less than 3.5 mm, the OVM6211 can easily be built into narrow-bezel devices. In addition, the CameraCubeChip allows for the use of standard surface-mount assembly processes, which can reduce both production cost and time-to-market for manufacturers." 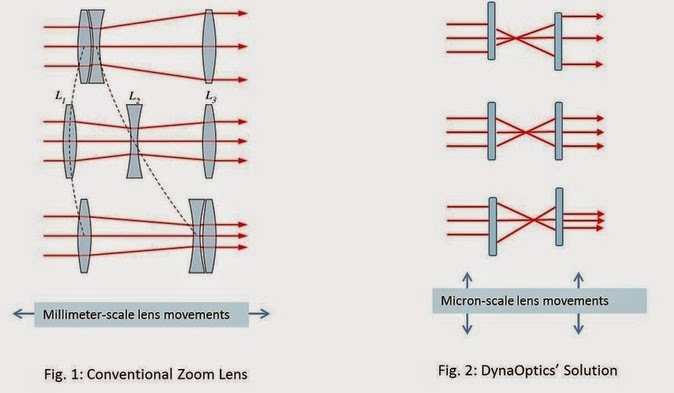 IEEE Spectrum: Singapore-based DynaOptics "says its technology will allow mobile device manufacturers to offer cameras with optical zoom without making the phone thicker or requiring the zoom lens to protrude. The company says its secret is its lenses: they are asymmetrical, so a sideways movement can change the perspective from near to far." DynaOptics has raised $2M to date, and is looking for more. The company expects to have engineering samples available for mobile device makers in Q1 2015, and will be ready to start mass production by late 2015. 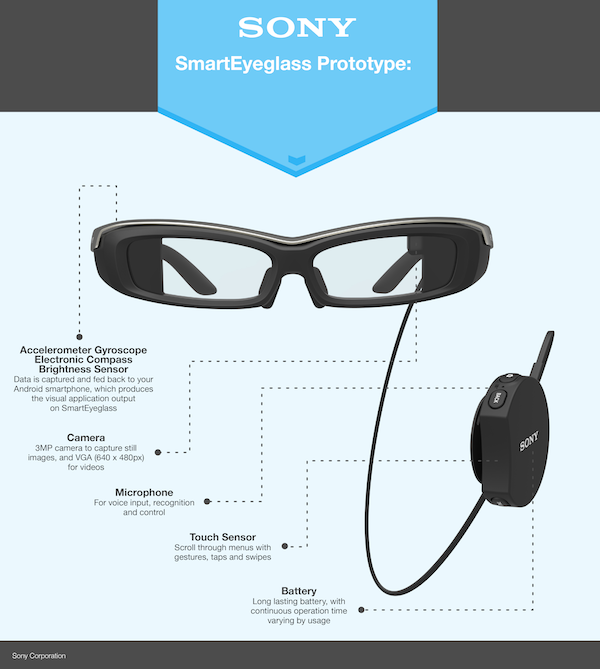 Update: MIT Technology Review too publishes an article on DynaOptics. Evolution of Design and Manufacturing of optical modules for mobile phone. Bernhard Schaffer, Senior R&D Engineer, CSEM S.A.
Development of Silicon Photomultipliers at FBK for nuclear medicine applications. Amit Agrawal (Amazon Lab126), Richard Baraniuk (Rice), David Brady (Duke), Robert Calderbank (Duke), Lawrence Carin (Duke), Ayan Chakrabarti (TTIC), Oliver Cossairt (Northwestern), Kristin Dana (Rutgers), Paolo Favaro (University of Bern), Carlos Fernandez-Granda (Stanford), Mohit Gupta (Columbia), Wolfgang Heidrich (KAUST), Kevin Kelly (Rice), Pascal Monasse (ENPC), Kari Pulli (Stanford), Ramesh Raskar (MIT), Neus Sabater (Technicolor), Guillermo Sapiro (Duke), Sabine Susstrunk (EPFL), Yohann Tendero (UCLA), Pauline Trouvé (Onera), Jack Tumblin (Northwestern), Ashok Veeraraghavan (Rice). Euronext: STMicro announces that it is commercializing an innovative TFP (Thin-Film Piezoelectric) MEMS technology. One of the first customers of ST`s TFP process is poLight, whose TLens (Tuneable Lens) uses a piezoelectric actuator to change the shape of a transparent polymer film, imitating the focussing function of the human eye. "Piezoelectric actuators and sensors can now be manufactured in our Agrate 8" Fab that has produced billions of motion sensors, taking full advantage of ST`s long-standing position as the world`s leading manufacturer of MEMS devices," said Anton Hofmeister, Group VP and GM of Custom MEMS Division, STMicroelectronics. "Our TFP MEMS technology rewrites the script, opening up new cost/benefit scenarios that will, in turn, enable many new applications." ST is targeting volume production for its pilot customers in mid-2015. Optics.org reports that tunable lens maker poLight has appointed Øyvind Isaksen as its new CEO. The former CEO Christian Dupont will become CMO in charge of Sales & Marketing. 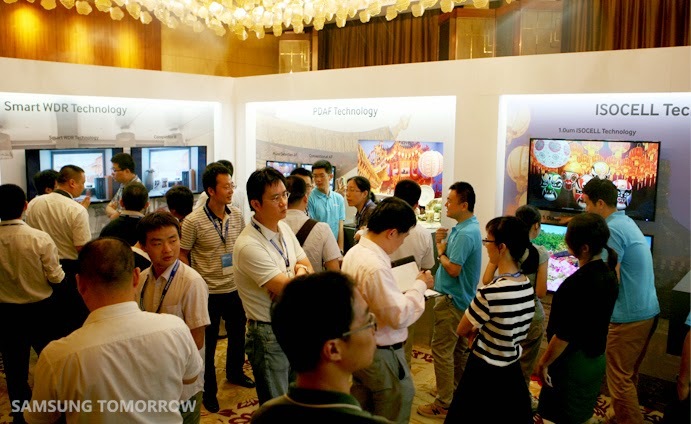 poLight is working with several potential customers and is in the process of establishing manufacturing capacity in a cooperation with a manufacturing partner. Mainstream production is planned to start in 2015 - in time to address a fast growing market estimated to grow from $1.2B in 2013 to $2B in 2017. "Having Øyvind Isaksen on board, we have in place a CEO with significant background from technology companies as well as extensive experience in leading a publicly listed company," says Chairman of the Board Keith Cornell. This paper proposes the integration of MOS Capacitor Deep Trench Isolation (CDTI) as a solution to boost image sensors’ pixels performances. We have investigated CDTI and compared it to oxide-filled Deep Trench Isolation (DTI) configurations, on silicon samples, with a fabrication based on TCAD simulations. The experiment measurements evaluated on CDTI without Sidewall Implantation exhibit very low dark current (~1aA at60°C for a 1.4μm pixel), high full-well capacity (~12000e-), and it shows quantum efficiency improvement compared to DTI configuration. We report the first demonstration of three-dimensional integrated CMOS image sensors with pixel-parallel A/D converters. Photodiode and inverter layers were directly bonded to provide each pixel with in-pixel A/D conversion. The developed sensor successfully captured images and confirmed excellent linearity with a wide dynamic range of more than 80 dB. We developed a stacked image sensor on the basis of thin-film crystalline-selenium (c-Se) heterojunction photodiode. Tellurium-diffused crystallization of producing uniform c-Se films was used to fabricate c-Se-based photodiodes laminated on complementary metal-oxide-semiconductor (CMOS) circuits, and we present herein the first high-resolution images obtained with such devices. 9.74-THz fundamental electronic detection for Far-Infrared (FIR) radiation is demonstrated. The detection along with that at 4.92 THz was realized using Schottky-barrier diode detection structures formed without any process modifications in CMOS. Peak optical responsivity (Rv) of 383 and ~14V/W at 4.92 and 9.74THz have been measured. The Rv at 9.74THz is 14X of that for the previously reported highest frequency electronic detection. The shot noise limited NEP at 4.92 and 9.74THz is ~0.43 and ~2nW/√Hz. Multiband light absorption and charge extraction in a stacked SOI multiband CCD are experimentally demonstrated for the first time. This proof of concept is a key step in the realization of the technology which promises multiple-fold efficiency improvements in color imaging over current filter- and prism-based approaches. Imec developed a new imager platform enabling the monolithic integration of 130 nm CMOS/CIS with charge coupled devices (CCD). The process module was successfully developed and the potential of this embedded CCD in CMOS (eCCD) was demonstrated with the fabrication of a time delay integration (TDI) imager. The Quanta Image Sensor (QIS) concept and recent work on its associated jot device are discussed. A bipolar jot and a pump gate jot are described. Both have been modelled in TCAD. The pump gate jot features a full well of 200 e- and conversion gain exceeding 300 uV/e-. The recent availability of miniaturized photoncounting pixels in standard CMOS processes has paved the way to the introduction of photon counting in low-cost time-of-flight cameras, robotics vision, mobile phones, and consumer electronics. In this paper we describe the technology at the core of this revolution: single-photon avalanche diodes (SPADs) and the architectures enabling SPAD based image sensors. We discuss tradeoffs and design trends, often referring to specific sensor chips and applications. Evolution of ultra-high-speed image sensors toward 1 Giga fps is presented with innovative technology to achieve the frame rate. The current highest frame rate is 16.7Mfps. A new sensor structure and a new driver circuit are proposed. Simulations prove that they further reduce the frame interval to 1ns. Imec has developed a process for the monolithic integration of optical filters on top of the CMOS imager sensors, leading to compact, cost-efficient and faster hyperspectral cameras with improved performance. To demonstrate the versatility of imec hyperspectral technology, prototype sensors with different filter arrangements and performance have been successfully fabricated. The cost of DNA sequencing has dropped significantly over the last decade, due in part to advances in high performance CCD and CMOS image sensors. 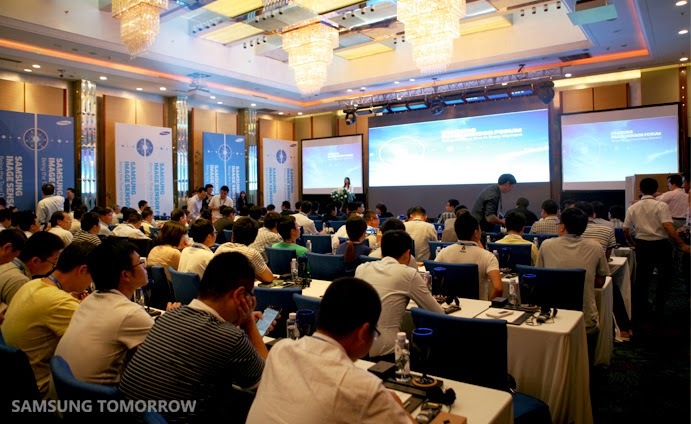 Key performance specifications – such as resolution, sensitivity, and frame-rate, along with the performance improvements necessary for continued cost reduction – will be discussed. 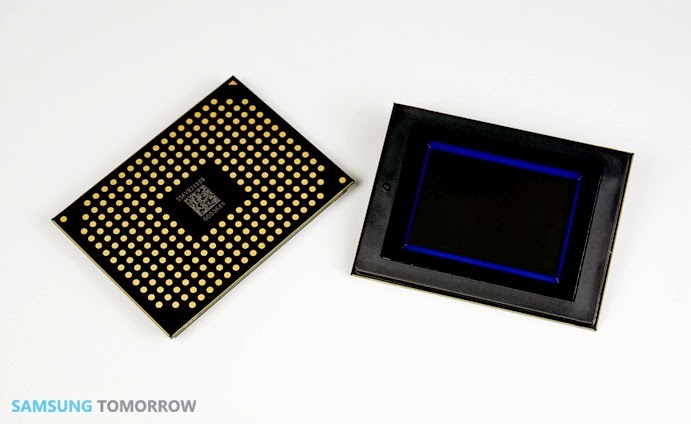 10.7 High Performance Silicon Imaging Arrays for . . . - looks like incomplete title in the agenda. On July 4th 2012 CERN announced the discovery of the Higgs Boson at the Large Hadron Collider. Englert and Higgs were awarded the Noble Prize for Physics in 2013 for postulating the existence of the boson along with Brout (now deceased) in 1964. The discovery was made possible by the combination of a machine capable of accelerating protons to unprecedented energies, and two huge detectors, called Atlas and CMS, able of record unambiguously the energy and location of the particle tracks produced by the collisions. Every 50ns bunches of protons are made to collide in the heart of the giant experiments and around 20-30 proton interactions take place generating thousands of debris particles. In searching for the Higgs boson, the particles participating in a given interaction need to be detected and tagged to a given bunch crossover (BCO). The innermost regions of the experiments are equipped with hybrid pixel detectors. This paper will provide a brief overview of the large scale hybrid pixel detector systems used at the LHC experiments. It will also describe how the same hybrid pixel detector approach is used in applications beyond high energy particle physics. G. Yu, C.-L. Shieh, J. Musolf, F. Foong, T. Xiao, G. Wang, K. Ottosson, CBRITE Inc. Recent progress on metal-oxide TFT with mobility and stability as good as LTPS-TFT and with uniformity and off current as good as pristine a-Si TFT will be presented. Their applications for high pixel density displays and image arrays are discussed with emphasis on pixel and peripheral circuits with analog functions. "The resolutions and frame rates of CMOS image sensors have increased greatly to meet demands for higher-definition video systems, but their design may soon be obsolete. That’s because photodetectors and signal processors lie in the same plane, on the substrate, and many pixels must time-share a signal processor. That makes it difficult to improve signal processing speed. NHK researchers developed a 3D parallel-processing architecture they call “pixel-parallel” processing, where each pixel has its own signal processor. Photodetectors and signal processors are built in different vertically stacked layers. The signal from each pixel is vertically transferred and processed in individual stacks. 3D stacking doesn’t degrade spatial resolution, so both high resolution and a high frame rate are achieved. 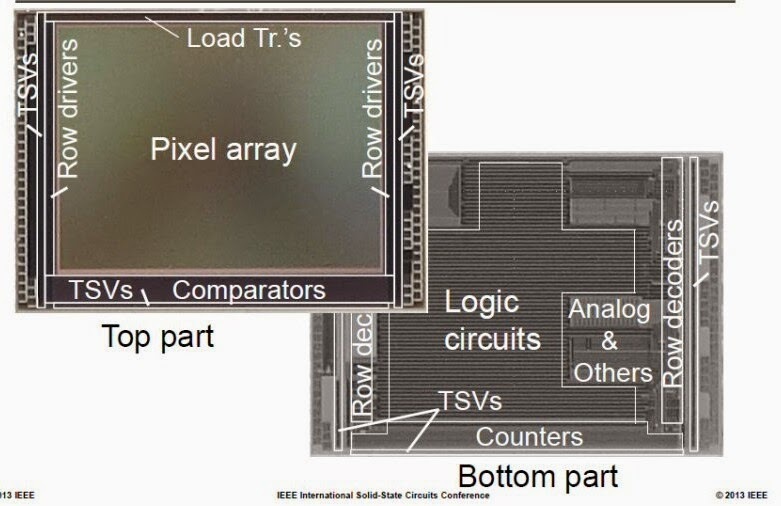 3D stacked image sensors have been reported previously, but they either didn’t have a signal processor in each stack or they used TSV/microbump technology, reducing resolution. NHK will discuss how photodiode and inverter layers were bonded with damascened gold electrodes to provide each pixel with analog-to-digital conversion and a pulse frequency output. A 64-pixel prototype sensor was built, which successfully captured video images and had a wide dynamic range of >80 dB, with the potential to be increased to >100 dB." Business Wire: MIPI Alliance introduces the new C-PHY spec, a physical layer interface for camera and display applications. "The MIPI C-PHY specification was developed to reduce the interface signaling rate to enable a wide range of high-performance and cost-optimized applications, such as very low-cost, low-resolution image sensors; sensors offering up to 60 megapixels; and even 4K display panels," said Rick Wietfeldt, chair of the MIPI Alliance Technical Steering Group. MIPI C-PHY departs from the conventional differential signaling on two-wire lanes and introduces 3-phase symbol encoding of about 2.28 bits per symbol to transmit data symbols on 3-wire lanes, or “trios” where each trio includes an embedded clock. Three trios operating at the C-PHY v1.0 rate of 2.5 Gsym/s achieve a peak bandwidth of 2.5 Gsym/s times 2.28 bits/symbol, or about 17.1 Gbps over a 9-wire interface that can be shared, if desired, with the MIPI D-PHY interface. The MIPI Alliance also announces updates to the MIPI D-PHY and MIPI M-PHY physical layer technologies. The updated MIPI D-PHY specification, v1.2, introduces lane-based data skew control in the receiver to achieve a peak transmission rate of 2.5 Gbps/lane or 10 Gbps over 4 lanes, compared to the v1.1 peak transmission rate of 1.5 Gbps/lane or 6 Gbps over 4 lanes. The MIPI M-PHY v3.1 specification introduces transmitter equalization to improve support for challenging channels while maintaining the peak transmission rate of 5.8 Gbps/lane or 23.2 Gbps over 4 lanes, which was achieved in its v3.0 specification.